The English Language Center (ELC) is an English Language school for international high school students. They are based in Boston but have programs in Los Angeles and Santa Barbara. Their summer program in Boston is at MIT and serves about 125 students with English classes in the mornings and more typical camp activities in the afternoon. 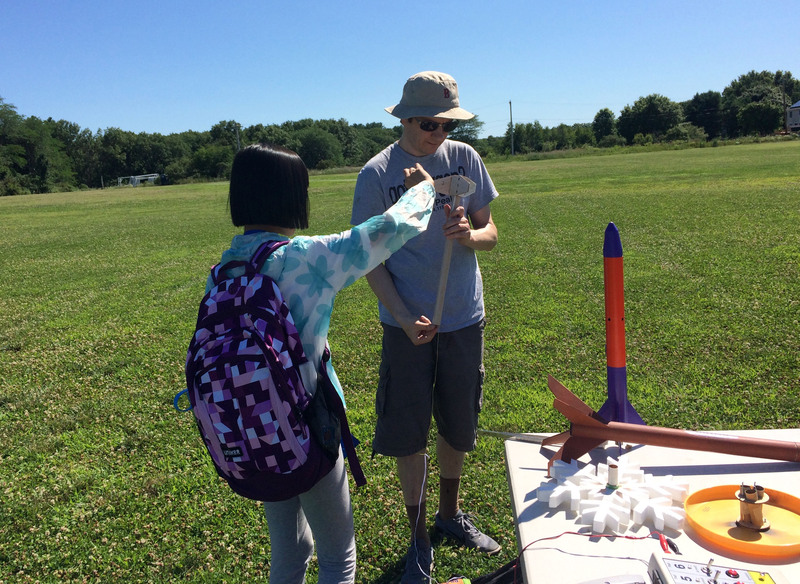 Since it is at MIT, there is a Science camp that includes an introduction to model rocketry. For the past few years CMASS has helped them with launching the rocket kits that they have built. There were 18 students this year and would be launching for 90 minutes at the School Street field in Acton. As usual, we use the launch equipment from the Page School. I and Alex set up three launch pads, which was more than enough. The students this year were mostly from China and Japan with a few from South America. They had built either the Razor (Custom Rockets) or the Thing-a-ma-jig (FlisKits). The first couple of years that we helped out, the rockets were in good shape and flew well. The quality had dropped over the next few years with this year being the most problematic. There were a number of rockets with fins attached with masking tape and others with motor mounts inserted (not glued!) into the body tube. Needless to say, we had a number of lawn darts, core samples and very interesting flights! I suspect that the person running the activity the first couple of years had rocketry experience but not so recently! The kids had a great time though! There are some pictures in the Gallery. I suspect we will be helping out at the build session next year as well!